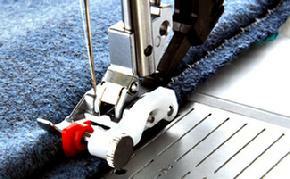 The Bi-level Topstitch Foot with IDTTM guides your topstitching and edge stitching perfectly. The underside of the presser foot is designed to glide along the folded edge, and it will give you beautiful topstitching on your project. 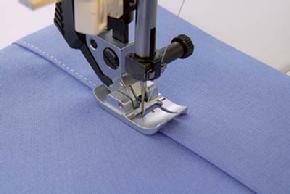 Use the Bi-level Topstitch Foot for hemming bulky projects such as waist bands, curtains etc. It will allow you to have the fabric outside the free arm for easier sewing. 1. 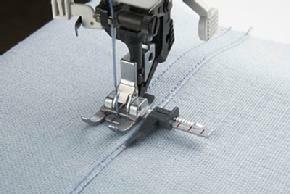 Snap on the Bi-level Topstitch Foot with IDTTM. 4. 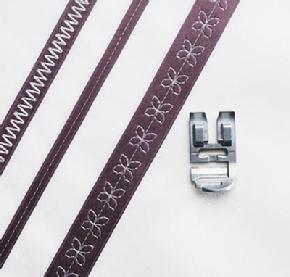 Use the inner left side of the presser foot to guide the fabric. 5. Adjust the needle position to left to get the topstitching distance you like. 1. Snap on the Felling Foot. 2. Place the wrong sides of the fabrics together. 4. Place this overlapping edge over the tongue of the Felling Foot. The fabric must be placed completely under the presser foot. 6. Separate the fabric and feed the extending hem into the Felling Foot. 7. The hem is turned by the foot and is stitched along the edge. Pull the two fabric layers taut during sewing. Embellish your project with different types of trims by using the Decorative trim Foot. This foot will easily guide the trims through the opening at the front and through the groove under the presser foot. 1. 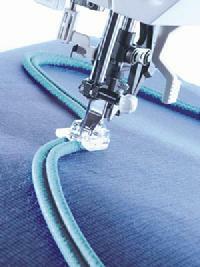 Thread your machine with a regular sewing thread or decorative thread on top and regular sewing thread in the bobbin. 2. Select a straight stitch, zigzag stitch or decorative stitch. Avoid using stitches with side motion and stitches with too much motion forward and back. 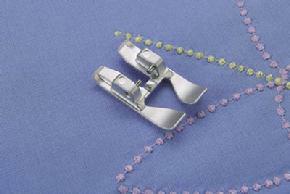 Tip: For the 6mm wide trims, you can also use a 6mm twin needle. Select a straight stitch and it will sew at the edges of the trim. 3. 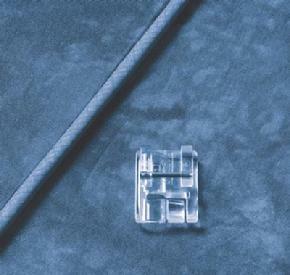 Place the trim in the presser foot as the picture shows. 4. Snap on the Decorative Trim Foot. 7. 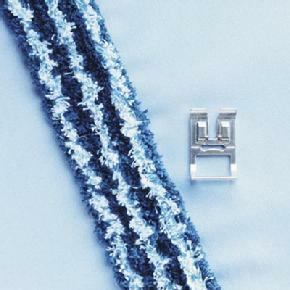 The best result is achieved if you use flat trims, such as silk, velvet, satin or cotton ribbons. Gathering is a classic decorative technique. It�s easy with this � special foot, which is especially useful for sewing flounces on cushions and curtains or for attaching gathered seams on children�s clothing. 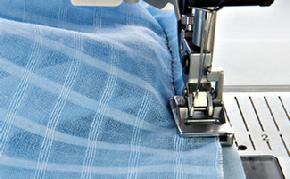 You can simultaneously stitch and gather two layers of fabric quickly and easily. 1. Set the machine for straight stitch with the needle in far left position. 2. Place fabric to be gathered under the presser foot with cut edge extending slightly to the right of the presser foot. Insert non-gathering fabric fully into slot of foot. Fabrics should be right sides together. 3. Guide fabric, allowing machine to pull bottom fabric freely for uniform gathering. TIP: Altering stitch length will alter fullness of gathers. A single layer of fabric may also be gathered by placing under foot and adjusting stitch length and tension to desired fullness. 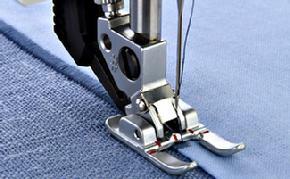 The Blindhem Foot is perfect for sewing invisible hems. 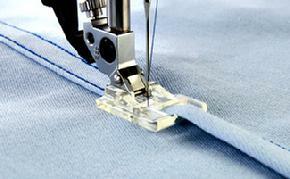 Use it to sew the elastic blindhem for an optional finish and you won�t need additional finishing on the hem edge. Sewing by hand is no longer necessary. 1. Snap on the Candlewicking foot with IDTTM. Perfect for appliqu� and other sewing applications requiring an unobstructed view of the sewing area. Produce beautiful appliqu� quickly and easily with this foot. 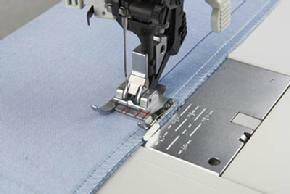 Use with a pin-stitch or shell-edging program to achieve an appliqu� with the look of handsewn overcasting. 2. Iron paper-backed fusible web onto the design. Tear the paper backing away and iron the appliqu� fabric onto the base material. 3. Attach the Open-Toe Appliqu� Foot with IDTTM (if available on your machine).